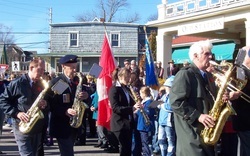 Band music has played an important part in the religious and military history of Mahone Bay. The community’s Lutheran Church, for example, had a band of its own in the late 1800s which operated until the start of the twentieth century. The Mahone Bay Band, itself, was a brass band affiliated with the militia called the 69th Battalion Band of the Annapolis Regiment, based at Annapolis Royal, Nova Scotia. It was one of three Lunenburg County bands that attended training sessions at Camp Aldershot, N.S., near Kentville, in the early 1900s. The Lunenburg Band went with the 75th Regiment, the Bridgewater Band accompanied the 68th Regiment while the Chester Band was normally a militia unit, according to a February 25, 1961 newspaper report. The 69th Battalion Band from Mahone Bay went to Camp Aldershot, during a ten-day training period each fall when the Annapolis Regiment was living there under canvas. This tradition continued for five or more seasons. “At Camp Aldershot, each band marched with the regiment to the training area and brought them back in the afternoon,” said an article by Roy K. Cooke, of the Halifax Chronicle-Herald. “With more than 20 bands in camps, it was a stirring sight and sound.” “Usually the bands played in the regimental mess every evening.” Following the First World War, the 69th Battalion musicians formed a 20 to 25-member civilian band that continued to play for garden parties and at exhibition parades including those held at Bridgewater, Liverpool and Shelburne. In the 1920s and 1930s, the bandsmen traveled by train to these performances in Lunenburg, Queens and Shelburne Counties. Eventually, as more and more cars took to South Shore Roads, the band players got around by automobile. Band practice, at one point, was held in an old village hall situated at the site of the Save Easy store in Mahone Bay. For a while, space for the musicians to practice was provided to the rear of the current Mahone Bay Town Hall. Warren H.G. Hirtle, who played in the band for about 40 years and was band master for several of them, said the town produced “good musicians". The band apparently was good for the health as well. For example, Mr. Hirtle was hale and hearty and playing band music at 80. Harris Smeltzer, was still vigorously marching and playing alto horn with brass bands at 77. Harris Smeltzer was the father of Phillip Smeltzer, the founder of the Mahone Bay Legion Band, and the late George Smeltzer, a member of the West Nova Scotia Regimental Band during The Second World War and a member of the legion group in the 1980s. The Mahone Bay civilian band continued to function into the early 1950s until more and more of the players moved away to find work. Mr. Hirtle described the break-up of that band as “regrettable”. He said, in an interview with the Lunenburg Progress Enterprise, that he hoped that a school band being formed at that time would someday form the basis of a new citizens band. The Mahone Bay School maintained a band until 1982 when it too was temporarily disbanded. The Legion band was formed the following year. The school band has been reincarnated at the new Bayview Community School under the direction of Gale Lohnes, a university music graduate and a former leader of the Bridgewater Fire Department Band. Mrs. Lohnes, who has been teaching music for 18 years, received the Prime Minister’s Award for Teaching in 2005. Earning provincial honours is a way of life for that school’s music program which is considered one of the best in Nova Scotia. The future of Mahone Bay’s musical tradition is in good hands. - Abridged from an article By John Cunningham (2010).